It is awfully easy, I find, to get into a cooking rut during the winter. For me, the shortening of the days and the addition of more horse chores during fall and winter (horses can just eat grass during the spring and summer! They require feedings during the other months of the year.) mean dinner becomes an afterthought. The default seems to be meat-heavy-dishes that just don’t excite me. What does excite me, though, is fresh bread. I knew planning a meal around a yeasted dough would get me excited to be in the kitchen (as opposed to dreading this final chore of the day). Thinking over types of breads I’ve not made, I settled on naan. This dough is super easy to work with and I adore that it is “baked” stove-top rather than in the oven. This leaves your oven free for baking cookies! Whisk together warm water, yeast and sugar until sugar is completely dissolved. Let stand for 10 minutes to proof. Sift flour and salt together, then add the yeast mixture, half of oil (2 tbsp) and yogurt. Mix dough with a wooden spoon. Place turn out on a floured counter and knead for 5 minutes. Place dough in a lightly greased bowl, cover with plastic wrap, and let rise for 1 1/2 hours or until it doubles in size. Punch down dough, then knead for 5 minutes. Divide into 8 pieces. Let rise for another 10 minutes. Roll each piece into an 8 inch round. Brush each side of the naan with remaining oil. 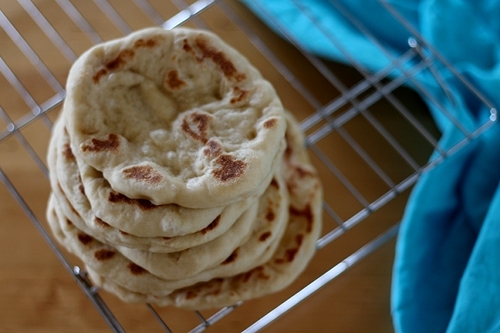 Heat skillet on medium-high and cook each naan round for 2 minutes per side until puffed and golden. Serve immediately. This entry was posted in Brady Evans Venables, Cooking, Food, Recipes and tagged Brady Evans Venables, Columbia, columbia sc, cooking, every woman blog, Famously Hot, food, hospital blog, Lexington, lexington medical center., lexington sc, Lexington Women, lmc, LMC every woman blogger, Midlands, Midlands Women, Recipes, South Carolina, South Carolina Women, Women, women's blog, women's hospital blog by Kate Gillmer. Bookmark the permalink.